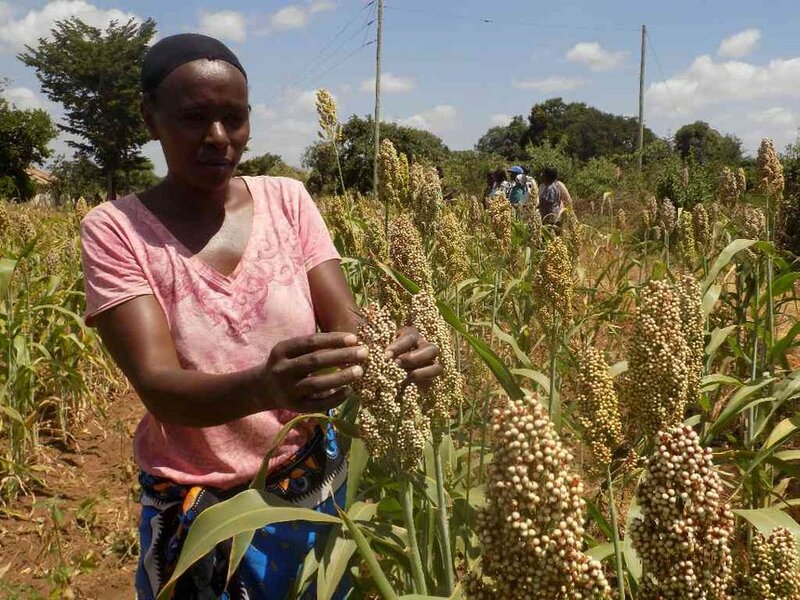 Mary Mathuri, a farmer in Makueini County, Kenya, tends to drought-resistant maize. Photo courtesy of Agatha Ngotho. The concept of transformational or transformative adaptation has gained traction in recent years in the field of climate change adaptation, stemming from the recognition that incremental adaptation is not, in many cases, enough. While the theoretical concept of transformational/transformative adaptation has been widely discussed and debated, there are fewer discussions surrounding examples of transformational adaptation in practice. The first in a series of working papers* published by Adaptation at Scale in Semi-Arid Regions (ASSAR), one of four consortia within the Collaborative Adaptation Research Initiative in Africa and Asia (CARIAA), contributes to this discussion. It draws on regional studies to understand factors and governance processes that have contributed to or prevented climate change adaptation from being more widespread and successful. *Download this paper from the right-hand column. The ASSAR team uses the term transformative adaptation as opposed to transformational adaptation throughout the working paper because ‘using, “transformative” as an adjective to “adaptation” implies an adaptation activity that can change other things’ (p. 3, See Box 1). ENV – Where an action is driven primarily by environmental change; it applies to a vulnerable human system or sector, the overall functioning of which is threatened by environmental change, and can lead to a response that is reactive or anticipatory. SOC-ENV - Where an action is socio-environmentally driven; this means it is a response to environmental change (reactive or anticipatory) but one aimed at reducing the differential impact of environmental change on particular vulnerable social groups (according to income, livelihood, sector, gender, ethnicity etc). SOC - Where an action is primarily socially-driven; this refers to a change that is primarily driven by social, cultural, economic or political concerns rather than environmental pressures, but which has a secondary or incidental outcome of adaptation to environmental change. Innovation - a completely novel activity or application of an activity in a new location. Expansion - an application of an existing activity at a much greater scale or much greater intensity. Reorganisation - a fundamental shift in organisational structures - such as radical change to political and administrative systems, institutional architectures, economic structures, development pathways. (1) Recognising adverse consequences, maladaptation and trade-offs. The authors note that transformation is not always desired or intended. If it is intended, it may not have the outcomes desired, or it may be maladaptive (in that it increases vulnerability rather than reduces it) – either for the targeted adaptation group or for others. Maladaptive outcomes can be seen in the following areas: equity issues and access to adaptation, impacts on livelihoods generally, exposure to other risks, and time scales. In Southern Africa, drip irrigation and rainwater harvesting are useful to combat drought conditions. However, these systems require capital investment, thus, farmers who use these technologies are likely those that have more capital to begin with. Consequently, they will have higher yields in times of drought, and gain more capital, while those unable to invest in these systems may lose capital. Similarly, in West Africa, crop genetic improvement can increase yields, but cannot be accessed by poor and women farmers. Moreover, the agricultural landscape of West Africa limits the wholesale introduction of these types of crops, so only those in certain areas reap the benefits. In Namibia, drought resistant millet has been introduced. However, farmers often complain that, in wet conditions, the millet rots. Moreover, it is not suitable for use as a building material as was the original millet. To combat the risks of the climate change to pastoralist communities, villagization was pursed in Ethiopia. However, settlement has also broken down social networks, eroded cultural heritage, and reduced access to natural resources. In Southern Africa, livestock can be moved in times of drought, but this movement can cause environmental degradation elsewhere, causing livestock in those areas to be more susceptible to drought in future. Change is not necessarily unidirectional. In India, groundwater pumps revolutionized irrigation in the 1970s, but 40 years on, groundwater depletion is now a serious issue. In West Africa, there are often uncoordinated institutional arrangements and a lack of institutional capacity. There is often a lack of urban focus. In Namibia, the authors note an overemphasis on emergency response, which can erode innovation capacities.